UPDATED 05/05/13: This has been edited to incorporate the Employment & Support Allowance Regulations 2013 that came into force 29/04/13. Are you about to claim for ESA or considering an Appeal or Tribunal? If so my Appeals & Tribunals Guide contains more practical information for you. Employment & Support Allowance is the new way of helping people with an illness or disability move into work or in practice support you if you are incapable of work. From October 2008 it replaced Incapacity Benefit and Income Support paid on Incapacity grounds. If you are aged between 16 and 20 (or under 25 if you were in education or training at least three months immediately before turning 20) there are further requirements. To claim you have to either telephone 0800 055 6688 or fill in an ESA1 form. You can download, print and complete one version here or download and complete the other version here and submit it electronicly. Central to Employment & Support Allowance is the Work Capability Assessment which is Supposed to examine what you can do and what you can’t do. The assessment includes looking at all the evidence about your condition and how it affects what you can do. When filling in an ESA50 you must detail how your Fibromyalgia and any other medical problems effect you on a day to day basis. This is your opportunity to provide evidence in support of your claim. The more information the better and try to use any medical reports from your doctor, consultant or health professional and any other information you can. Have a good think about anyone who can back you up, for example you may have someone who cares for you, or you may have accessed private medical services such as a physiotherapist. If any of these people can provide the jobcentre with evidence of how your Fibromyalgia effects you, then get a report from them, as I can say from experience they do not just take your word for it. If you are worried about costs then detail who the people are in your form and tell the jobcentre that they can provide evidence to them to support your claim. In most cases the jobcentre will send them a form to complete and will pay them an agreed fee, however it is a good idea to tell these people they may get a form about you, so they are more likely to respond and provide good information. It is also important to note that they can not ask for your personal medical information without our consent. Subject to your application being successful so far, you will probably be invited to attend a Work Capability Assessment. These are conducted by a private company called ATOS Healthcare. They are surrounded in controversy, however for the moment we will just deal with the facts. 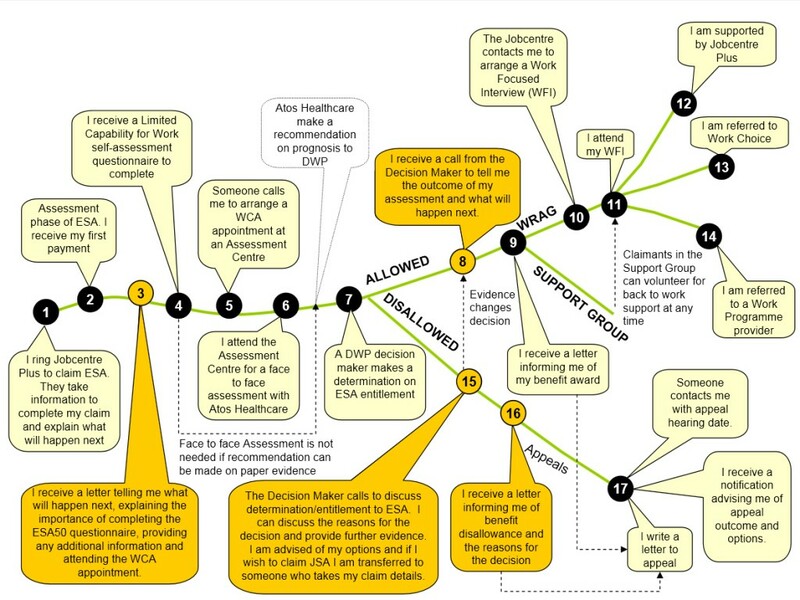 In rare cases you may have provided enough information (with your ESA50 and accompanying evidence) for the DWP to make a decision on, if this is the case a decision will be made and you may not be required to attend a Work Capability Assessment. Your assessment will take place at one of ATOS Healthcare medical assessment centres normally in the closest town or city to you. They normally ask you to make your own way there by car or by public transport. Some people can be offered a taxi to and from the assessment so it is important to speak to them if you have any problems getting there. You are also entitled to travel expenses. Do make sure you keep any receipts. Take with you any medications as well as an official form of identification. Expect the assessment to last about 45 minutes. While you’re there, expect to be asked how you got there, how long it took, how far you walked and did you need help. This will be used in evidence of your capability. You will be asked about your job, or your last job, your medical history, your domestic situation and what a typical day is for you. You will normally be asked questions about the information you supplied on your ESA50 and what you can do around the house and what you can do outside of the house. You will then be asked to do various small tasks to assess your mobility such as bending, reaching etc. Bear in mind that you will be watched very closely when you are there, when you walk into the assessment and how long you sit down for, how long you can stand up for and this will be recorded on the report. If you can not attend the assessment centre at all because of your condition then you can request a home visit. I have requested one and have been refused. I was advised to get a letter from my GP which I did (at my own cost) but I was still refused. I just thought I better mention it as you may have more luck than I did. I will be looking into their contractual obligations at some point soon. The medical professional will then complete form ESA85 for the jobcentre. This is determined by law and the current legislation is The Employment and Support Allowance Regulations 2013 That came into force 29th April 2013. To get into the Work related activity group you will need to score 15 points under this criteria and not qualify for the Support Group. My Advice: If you believe you are entitled to ESA then work out for yourself how many points you believe you should get and for what. Then commit them to memory so that when you go to your Work Capability Assessment, you will know what you need to prove in order to get your 15 points or more for the Work Related Activity Group, or what you need to prove to be placed in the Support Group. Remember, it is up to you to prove these points, so make sure you know them and gather as much evidence as possible to support them. If you are placed in this group then you are considered unfit to work or to take part in work related activity. In practice it is very hard to get yourself placed in this group and most people in the group will have gone through the appeals process to get there according to recent statistics. If you are placed in this group then you are considered fit for work related activity. In practice you will receive an appointment with an adviser at your local Job Centre. When you attend the appointment you may be referred onto a private agency to undertake work related activity. To see which private agencies operate in which areas of the UK click here The purpose is to offer you the help and support you need to get into the workplace. It is important to tell them if you do not feel this is correct for you. It is worth noting that if you tell them this, they will just ask you to appeal and state you believe you should be in the Support Group. However, you need to bear in mind you will have to prove that you qualify for the Support Group and it is up to you to provide the evidence. For a single person aged under 25 it is up to £56.80 a week. For a single person aged 25 or over it is up to £71.70 a week. For a single person aged under 25 it is up to £100.15 a week. For a single person aged 25 or over it is up to £106.50 a week. In most cases you will not get any money for the first three days of your claim. These are called ‘waiting days’. Depending on your circumstances, you may be able to get more money if you get income-related Employment & Support Allowance. You can only get extra money for your husband, wife or civil partner if you get income-related Employment & Support Allowance. UPDATE: The Benefit CapThis year sees the introduction of the Benefit Cap for certain people & Employment & Support Allowance is included. However if you receive Disability Living Allowance OR you are in the Support Group for ESA you shouldn’t be affected. Local councils will be introducing this between 15 April and 30 September 2013. It is also a little complicated to explain, there are exceptions to the rules, so the best advice I can give is to read about it on the gov.uk website. There are further rules if you receive a pension and more information can be found here. It is also important to realise contribution based Employment & Support Allowance counts as taxable income but income based Employment & Support Allowance does not. The following is basic information about Appeals, if you are thinking about appealing, or are in the process of appealing you need to read my new Appeals & Tribunals Guide as it is written with you in mind. Your appeal will be looked at by a decision maker who can change the decision. Make sure you have collected as much evidence as you can to support your appeal. If your appeal goes against the medical report then you’re going to need more evidence, as it is very unlikely they will just take your word for anything, no matter how true it may be, without proof. It is good practice to make sure you request all documentation used in your case, this will ensure that you have all the information that they have about your case. If you are requesting documentation, they may stop the clock for your appeal, until they send the documentation out. However, you should not rely on this and you will need written confirmation, that they have agreed to this, if you should ask for it. The following is basic information about Tribunals, if you are thinking about going to Tribunal, or are in the process of forming your case for a Tribunal you need to read my new Appeals & Tribunals Guide as it is written with you in mind. If you have appealed against an appeal decision then your case will go to tribunal. You appeal in the same way and the Job Centre Plus Office will prepare your case and it will be heard by an independent appeal tribunal. It is important to note that they should still pay your ESA if you provide them with a certificate from your GP that states that you are considered unfit for work. The Jobcentre Plus must provide the tribunal with the evidence they have and why they believe you are not entitled to ESA. When the Tribunals Service receive this the will write to you to tell you that they are dealing with your case. They will also tell you which centre they propose to use for the hearing and this should be the one closest to where you live. They will ask for confirmation from you, that you wish to go ahead with your tribunal and you must reply to this within 14 days. You should be kept informed as to how long it will take to hear your case. In practice there can be severe backlogs, however, they should inform you if this is the case. When a date and time is set you will be informed and you will be invited to attend. It is advisable to attend if at all possible, as more decisions are made in favour of the claimant when they attend. It is important to tell them if you will not be attending and the reasons why. If the decision to not award you with ESA is wrong, then the tribunal can overturn it, but they cannot change the law that the decision is based on, pay more money than the law allows, or check or change your contribution record. It has never been more important for people applying for benefits because of Fibromyalgia to know about the law (and I hate the fact I feel it is necessary to say this). It is also important for anyone assisting someone with Fibromyalgia apply for benefits, to know the law as well. I will try and make it as easy for people as possible to gain this knowledge from this section of this website and the links I am about to provide. A more detailed analysis of the law is available on my Appeals & Tribunals Guide.